As well as there being three big Sky Bet League Two points up for grabs this Saturday, an old managerial rivalrly between Cobblers boss Keith Curle and Cambridge United counterpart Colin Calderwood will be revived at the Abbey Stadium. Back in the 2003/04 season, both men were in their first rookie roles as managers, with 39-year-old Calderwood taking charge of the Cobblers and 41-year-old Curle in the Mansfield Town hot seat. Over the course of the season, the pair locked horns no fewer than four times - with the final three of those coming in the space of just 12 thrilling days at the end of the campaign. 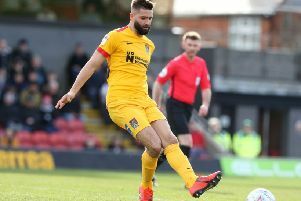 The first meeting between the clubs in November saw the Stags coast to a 3-0 win at Sixfields, but on May 8 the Cobblers went to Field Mill on the final day of the regular season. They needed a win to confirm their place in the division three play-offs and sealed a dramatic 2-1 win thanks a goal from Eric Sabin and an unlikely winning strike from Rob Ullathorne. That win meant Town would face Mansfield in the promotion play-offs, and on May 16 the Stags had another successful Sixfields outing, winning the first leg 2-0. It looked like game over, but the second leg a few days later proved to be ‘one of those nights’, with the Cobblers playing brilliantly to take a 3-0 lead thanks to goals from Marc Richards, Chris Hargreaves and Martin Smith, only for controversy to reign. Tom Curtis pulled a goal back for Mansfield to level the aggregate score - but it came just minutes after he should have been sent off by referee Phil Crossley for a foul on Sabin. Crossley went for his cards and it looked as though Curtis was going to get a second booking and be dismissed - but mystifyingly the referee seemed to change his mind, and instead booked Sabin for his reaction to the Curtis foul. He even awarded Mansfield the free-kick. It may have been 14 years ago, but I tell you what, it still grates! It was a decision that stunned everybody associated with the Cobblers but, perhaps not surprisingly, current Town boss Curle thought that Crossley got things right. And looking back on that match and those tussles with Calderwood’s men, Curle added: “I remember it. I remember the first leg when we won 2-0 but I knew in my mind that the game wasn’t over. “We went through on penalties, and Tom Curtis scored the goal that took it to penalties. “I can still remember now the ball coming out to him on the edge of the box, and Tom was not a renowned finisher, and he was even worse on his unfavoured foot. “The next thing he has let it go and I am thinking ‘where’s this going to end up?’. The next thing I know the ball has nestled in the corner, and it was complete jubilation. “Then with the penalties, I have to say our penalties on the day were superb. “But it was a great encounter, a great game and a good advert for both teams. “It was a tie over the two legs that had everything, as not many people would have fancied us to go to Northampton and come back with a 2-0 lead, because Northampton were playing well at the time. The duo would square up once more in the opening weeks of the following season, with Mansfield, who lost the play-off final to Huddersfield Town, hammering a reshaped Town team 4-1 at Field Mill, but Curle then left Mansfield a few months later, and the rivalry was nipped in the bud. Calderwood stayed at the Cobblers for a further two seasons, and he did come up against Curle’s Chester team in November, 2005, before eventually winning promotion to division two in 2006. But, as seems to be the habit with successful Cobblers managers of late, he immediately left the club to manage Nottingham Forest. Both men eventually ended up dropping out of management to take up assistant manager roles, with Curle twice working under Neil Warnock, and Calderwood enjoying a string of roles alongside Chris Hughton before he went to Aston Villa as Steve Bruce’s number two in 2017. Curle has of course been back in the managerial hot seat for a few years now, but for Calderwood, who still lives in the Northampton area, he is going to have to learn the ropes all over again as he tries to secure Cambridge’s Football League survival, with this being his first management job since leaving Hibernian in 2011. Current Cobblers boss Curle believes the former Tottenham and Scotland defender will do that and is glad to see him back in management. He also feels the fact Calderwood has followed a similar path to him with regards to stepping away from management for a period will stand him in good stead. “I am glad to see him back, but I think he has enjoyed his time as well (as an assistant),” said the Cobblers boss. “Colin is a football person, he has good principles, good mannerisms, a very good understanding of the game. “He has had an excellent career, and he was very similar to myself in that he went into management and then came back out and went as a number two. “I spent time working with Neil Warnock at Crystal Palace and QPR, and enjoyed it and probably got my love back for the game. “But I realised I wanted to be a manager, I had a desire to be a manager, and I am better equipped now with the time I spent with Neil, and also the time I spent up at Carlisle. “I learned a lot about myself, how I want to manage and how I want to be perceived by other people, but also how I want to be perceived within the football club. Calderwood is also a fan of Curle’s approach, and is looking forward to locking horns with him again this weekend. “Keith’s an experienced manager and a good manager and one who was probably a real close rival, especially in my first season at Northampton Town,” said the 53-year-old. “I have a lot of respect for him and his teams have always been organised of course but they have that variation in their play which makes them interesting to play against. “You can see that he is innovative in how he goes about his work. “We’re looking forward to a test, and I’m sure it’ll be slightly different from the game we played last week (Cambridge won 1-0 at Notts County). It’s also a big match for the Cobblers of course, and the Town supporters will be hoping Curle can get another one over his old foe.